While driving to work this morning I heard a very interesting story that got me a bit excited. 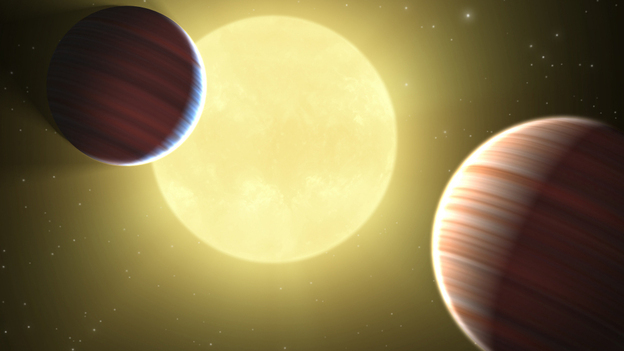 Several scientist / astronomers have found 2 new solar systems, each solar system contains and earth like planet at least in size. One planet is just 40% larger, and the other is 50% larger than earth. Why is this such a big deal? Well not because we are going to send humans there, as the planets are light years away, but because until now scientist were unable to detect planets any smaller than Jupiter or Saturn. Planets outside our solar system are near impossible to see at the moment because they do not radiate or give off much light. Most of the light that would be given off is reflected light from there star, and in contrast to the star the planet is around a 1 billion times less bright. So scientist recently have discovered planets by using the “wobble method”. I’m not sure that is the name of the method, but this is how it works. When planets, especially very large planets orbit a star, the star is slightly tugged in the direction of the planet. By measuring these wobbles over large periods of times scientist can determine the orbit and size of a planet. Large planets pull the star further than smaller planets. Using this technique scientist have found some 500+ planets in the last 10 or so years.